We stole most of our favorite holiday traditions from other cultures. The Christmas tree, the hiding of treats in footwear (many cultures use shoes instead of stockings), and of course, everyone’s favorite…Santa Claus. 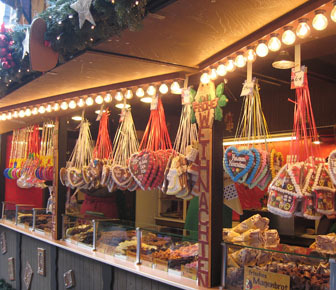 But the best Christmas tradition that we didn’t steal is the German Christmas Market. These outdoor markets brim with crafts and goodies. 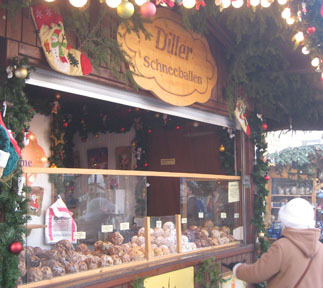 Vendors nestle inside quaint booths topped with exquisite manger or winter scenes. 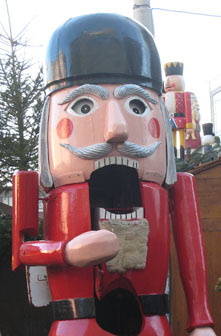 They have old-fashioned carousels, ice skating rinks, gigantic nutcrackers, and lights and ornaments galore. Who doesn’t need a heart-shaped gingerbread (lebkuchen) cookie to hang around her neck? Or a chocolate-drizzled dessert that doubles as an awesome snowball (schneeball)? We had no problem stealing the Oktoberfest idea and running with it. So why not Christmas Markets? After all, eating cookies and chocolate is way more fun than brats and sauerkraut. It’s too cold, you say? The Germans have that all figured out. 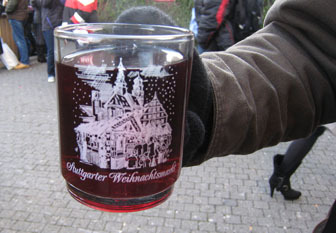 While the kids get hyped up on sugar, the grownups stay toasty warm by drinking mugs of hot spiced wine known as glühwein (pronounced gluevine). Eating cookies and drinking wine in the streets? Sign me up! Yeah Octoberfest and Christmas in Germany! Love you Aurora!